(Beijing, 4 January 2014) Charge d'Affaires a. i. of the Embassy of Serbia in Beijing Mrs. Tatjana Panajotović Cvetković visited Harbin Normal University on 3 January 2014. On that occasion she had talks with the representatives of the University and the Institute of Slavic languages, where Serbian language is taught on a facultative basis. During the meeting, the current cooperation with educational institutions in Serbia and possibilities for its further improvement was discussed. 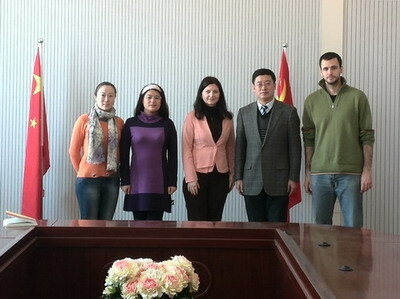 At the Institute for Slavic languages currently 140 Chinese students learn Serbian language, helped by a Serbian language lector Mr. Vladan Jočić. Mrs. Panajotović Cvetković stressed great importance of educational cooperation between Serbia and China and wished the students of Serbian language success in their further studying.